I apologize that I am just now getting back to you but I wanted to thank you for two of the best days that we had during our 3 week trip to Italy. 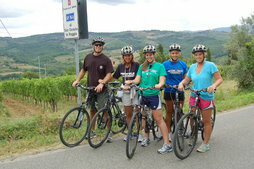 We absolutely loved biking with you and so enjoyed the rides. They were pristine and both Brian and I could not get over how quiet, beautiful and well maintained the roads were. You definitely know where to go and the best way to get there. We also appreciated the exceptional equipment you provided. The bikes and pedals were terrific and very familiar and comfortable. Hope you are enjoying your spring. We think of our trip all the time and can't wait to get back. La vallée du Chianti sous le soleil de Toscane fut une randonnée inoubliable. La beauté du paysage valait bien tous les efforts mis à pédaler. Notre guide, passoniée du vin et du vélo, nous a proposé plusieurs choix afin de rendre le circuit très personalisé. Je reviendrais chaque année si c'était possible. THE BEST TOUR OF OUR LIVES! Just a quick email to let you know we arrived safely back in Australia last Sunday. We are slowly catching up with life again here but we can’t stop thinking about you guys and the Val d’Orcia! Thank you for a wonderful tour. The views were all postcards! Your hospitality was overwhelming and the food and wine to die for! The bikes and the cycling was also truly professional thanks to Marco. The best restaurants too! We can’t wait to save up again and come back – maybe Blue Waters or Sicily in September next year. Thanks again for an excellent adventure--cycling we'll never forget, and we want to go again. 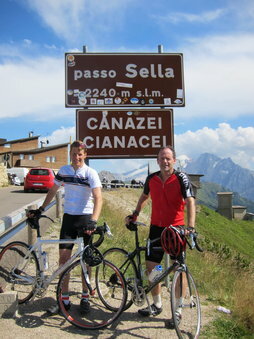 We know there are other passes in the Dolomites and many routes in Tuscany we have yet to see. 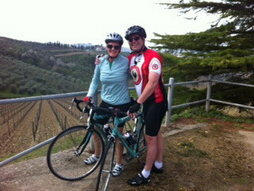 This is Dina from US - my husband and I did the Chianti 2 tour with you back at the end of September. I just wanted to say how great that ride was and having been in the States for a couple of weeks now, we keep remembering our trip and your tour was definitely a highlight of it. We went to Siena next day with a driver and that tour paled in comparison. Thank you for the pleasant day, a beautiful ride and great company. I hope you are all doing well. We made it back to Illinois safe and tired. :) I am now trying to go through my 1500 photos! First of all, Marco and Jodie, I want to thank you again for the wonderful trip. It was the best part of our vacation! I plan to send you some more photos from our bike tour as I go through them. Catherine & Lizzy, could you send me at least the photo of us all biking up the hill? The one Marco took. Also if you have another photo of you gals, I'd like it. I don't have many of you! 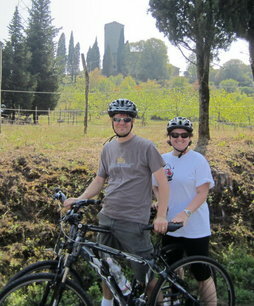 Here are some pics from our bike ride through Tuscany. Despite the weather, we had a great time and built great memories. You did a great job taking care of my family and showing us a wonderful time. 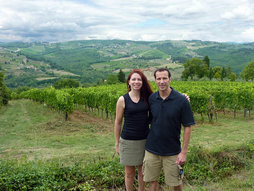 My husband Steve and I finished our “Your Tuscan Sun” tour a few weeks ago as our Honeymoon trip. We had an absolutely AMAZING time. I couldn’t have imagined the trip being any more perfect. Marco was a phenomenal guide, the biking tours were exactly the right level for us, the accommodations started out great and just got better and better, and we appreciated having everything put together and planned so all we had to do was enjoy ourselves along the trip. We spent the whole week after the tour in Northern Italy relaxing by lake Como, talking about how much fun we had on the bike trip. Now that we’re home in Chicago, we’re already thinking about when we can plan our next biking vacation, and which of the We Bike Tuscany tours we want to do next. I know that you and Marco are in frequent communication so if you would, please do pass along our special thanks to him for making the experience such a great one. We also really appreciate the calendar he gave us as a wedding gift. We’ll enjoy looking at all of those pictures next year and will think of the incredible week we spent together in Tuscany every day. We're back in the US after our wonderful vacation. Thank you so much for the great day last Friday. We enjoyed it very much. Even though the weather did not fully cooperate you did a great job making it a very good and interesting day. I hope to be able to make a similar trip again in the future and I'll certainly get back to you when I start pulling my plans together. It was great to meet and spend some time with a fellow Pennsylvanian. Thanks again for a wonderful day in a beautiful place.